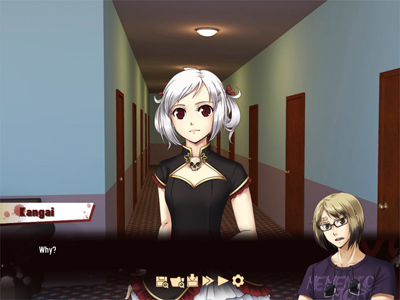 Yousei is the third game in the Jisei series, a trilogy of mystery visual novels centering around teenagers with psychic powers investigating murders for the government. In the adventure/visual novel Yousei, nomadic Kangai returns to his hometown, but his arrival has set off a series of deaths tied to his past. He is recruited for a government team of psychic teenagers who solve mysteries. The group goes undercover at a local college to dig into Kangai’s past, but the shocking death of a professor gives them a new direction — beating an old enemy for valuable information. Players control Kangai in exploring the campus, questioning suspects, and uncovering the truths behind elaborate lies.